This rare and interesting name is of French origin, and derives from 'haubergeon'. The term was probably introduced into England at the Norman Conquest of 1066. In its various and colourful spellings it is a metonymic occupational name for a maker of 'habergeons', which were sleeveless jackets of mail or scale armour, worn also as a rough garment whilst making a penance. 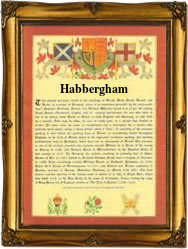 Whilst the original French is basically retained in the spellings of Habershon, Habbershon, Habberjam, Habbijam, and Habergham, it is also wholly anglicized in the spelling as Habgood, in fact it almost defies logic. The surname, not surprisingly was originally strongly associated with the steel city of Sheffield, Gilberto Haberiambe being recorded at St Peters Church, Sheffield on April 4th 1585, whilst later examples include William Habershon at Sheffield Cathedral on July 4th 1777, and Matthew Habershon, (1789 - 1852) who was the architect of the Anglican Cathedral in Jerusalem. This surname is sometimes confused with Habbeshaw, which has a similar French origin, being a maker of hauberks. The first recorded spelling of the family name is shown to be that of Matthew de Habercham, which was dated 1269, in the Lancashire Inquisitions, during the reign of King Henry 111, known as 'The Frenchman', 1216-1272. Surnames became necessary when governments introduced personal taxation. In England this was known as Poll Tax. Throughout the centuries, surnames in every country have continued to "develop" often leading to astonishing variants of the original spelling.